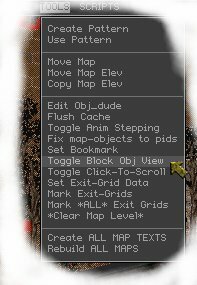 Exit grids are in the misc list in the editor. There are 3 different colours in the list, and 8 different blocks for each colour.. IMPORTANT!! !...ONLY USE THE GREEN ONES!!! The brown and black ones do not work... they are for internal use to the editor only..
Each pair has it's "handle" at opposite ends..
You place the blocks so that the "handle" end faces where the player would enter the grid from..
Exit grids do not automatically show up on the pip boy minimap, so you need to mark them. 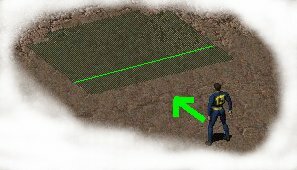 To do this you need to place exit grid markers ( scenery tile no 48 ) around the grid. 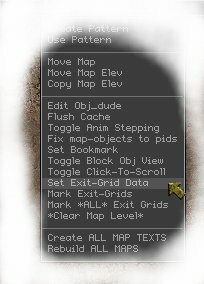 These will be invisible, so turn on the "toggle block obj view" in the tools menu. Now that you have your exit grid placed and marked, you need to set it to go somewhere.. The exit grid data consists of 4 values.. dest map, dest tile no#, elevation, and rotation.. 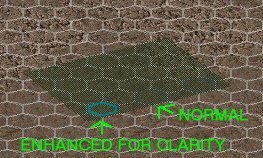 The second (dest tile no#) is the number of the tile you want to start on in the new map.. ( i think if you leave it as -1 it uses the hex you set with the "set start hex" option ). This is useful if you have more than 1 entrance to the map as you can put the player next to the right entrance.. The fourth (rotation) sets the direction the player will be facing on the destination map..
Once the data is set, you need to mark which exit grid you want to use that data with. 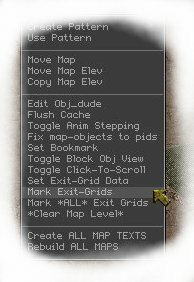 select "mark exit grid" from the tools menu..
the editor will pop up a box saying "entering mark exit grid mode" ( or something like that ). Just click on all of the grid pieces you want to set as going to the destination you set in exit grid data.. NOTE!! there is NO way to check what destination a grid is set to..